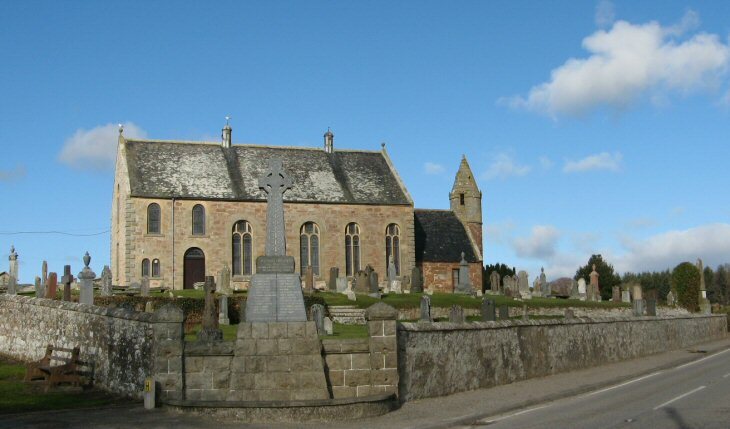 This churchyard is about 3 miles NE of Invergordon, within the rich farmlands of Easter Ross. There are open views across the Firth towards Cromarty. It can be accessed from the B817, or via a minor road off the A9 Trunk Road, about 2 miles W. of Kildary (signposted at junction). Picture Added on 22 March 2010. I am looking for my great, great grandfather Colin Kemp b.1827 Kiltearn or Rosskeen. He was in Royal Artillery 20 years mostly at Corfu. Ended as Master Gunner with exemplary record. Assume he bought small shop at Barbarville for wife, Jane Menzies married 1871 Aberdeen Old Machar. (info from I.G.I.) Colin died 1876-80 as not on 1881 Census. He signed a 'cross' in Army so was a KEMPT rest of his life!! My great Aunt and uncle, his daughter was Alexandrina Kempt + brother Phillip Kempt. Colin Kemp(T')s father was Alexander Kemp b 1791 Kiltearn married Janet Simpson but moved to Aberdeen as stone mason. She was shown (1881 Census) born at Tarbat -was this the Parish or the big House by Barbaraville? Death of them both is unknown. Christine and Ann Kemp, sisters of Colin Kemp(T) on 1881 Census at their Barbaraville Shop with widowed mother. Any details of their birth/ death/ etc would be appreciated. I listed every Kemp I spotted in the original old Kiltearn Registers and are on my Tree from early 1700 with 4 males married. They were Alexander / Colin - tacksman and shoemaker/ Donald - aglab/ and Grigor - servant at Culbain. Not all on I.G.I. ! Added by Elspeth Davidson on 01 September 2010. Many thanks for all the trouble you took to do this amazing work, we owe you a debt of gratitude and be blessed! Added by Elma Iversen daughter in law to Edith Iversen daughter of Ronald Urquhart and Ann Sutherland on 10 April 2012. I am trying to locate my Great Great Grandfather's grave in this cemetary. His name was John Munro and died in 1857. According to his death certificate, he is buried in Kilmuir Easter. I am also interested in any othe Munro graves that are here as well. Thanks! Added by Charles Munro on 31 October 2012. Oh please, say someone can help me, before I start pulling my own hair out! I've come to a real dead end looking for relatives on my Fathers side. Has anyone come across the names Murdo (Murdoch) and Margaret MacGregor (nee Baine)? Alexander MacGregor (born 1799 in Dingwall). The only record I've found of Murdo and Margaret is from the 1841 Scotland Census. They lived on Broom Hill in Kilmuir Easter parish, Ross and Cromarty. Living with them were David and Margaret MacKenzie (aged 16 and 12). As far as I can work out, these are M&M's grandchildren - their daughter Margaret married Murdoch MacKenzie. Also living with them was George Wright, aged 14 - I'm not sure who he is. I can find no death records either. Added by Jo Paterson on 11 December 2014.